Humans have enjoyed their lavish, peaceful, and prosperous lives for seven years since the day the almighty Spiral King was defeated—the day they reclaimed their homeland, Earth. However, the boon of this lifestyle leaves them unprepared when an unknown, hostile threat arises due to the ever-growing human population. This calamity is the Anti-Spiral—a fearsome enemy with unparalleled power. As the Spiral King's prognosis postulating the destruction of "The Spiral's World" begins to come true, the pieces are in place, and Team Dai-Gurren is ready. With his late brother's hope to see a better future for mankind, Simon—along with Nia Teppelin and the rest of the team—is determined to overthrow the mighty Anti-Spiral in order to revive humanity's lost hope. This movie was INCREDIBLE. It was definitely worth spending 1500 yen at Akihabara's sunshine theatre. The movie included much more different scenes than the first movie Gurren-hen, and the last battle was so intense, one couldn't blink to miss anything. The background music for this movie was as well different than from the series, and very fitting with each scene of the movie. If you're being shaken by the physics in this anime and feel the need to argue with them, you're missing the point. The second recap movie that introduces loads of new mechs to the Gurren Lagann multiverse is just as stunning as the original series was. Be warned as this review contains spoilers to the original Tengen Toppa Gurren Lagann and the first movie. *The reason I purposely left out individual scores is because I can safely say that I was biased during watching this film, and I will thus be biased towards writing this review. Note: I am pro-Gurren Lagann and all for manly screaming, yelling, pointing, crying, dying, fighting, punching, kicking, galaxy smashing, and most importantly - heaven piercing. The movie resumes from the point where the Spiral King has been defeated and Kamina City is being built. The spirals of Earth have lived peacefully for seven years and, surprise, the cast has aged and matured along with the planet. All is well - Yoko is a school teacher somewhere far-off, Viral the immortal Beastman has been imprisoned, Rossiu is a powerful leader in the new worlds government, and Simon is regarded as the hero of all humans in defeating the Spiral King. Peace is boring, and just as requested an enormous battle begins - no less, right as Simon proposes to Nia. The first hour of the movie is dedicated to story taking place on Earth. Albeit a little choppy, it doesn't lose it's impact. The second hour of the film is the battle for the universe against the Anti-Spirals in space, with an entire newly animated ending full of explosions, outrageous over-the-top screaming, fighting for justice and all that good stuff. If you loved the original series, you won't be disappointed. The animation and art are as beautiful as ever. The colors are vivid and thrilling, bringing the experience of using a galaxy as a weapon right to your home computer. Not much to be said as a lot of the animation is reused, but the new scenes are just as good, if not better, than the originals. The amount of art put into faces and mechs (and mech faces) still amazes me to this day. Do the impossible. See the invisible. Row. Row. Fight the powah. I hope that sums up the musical score. Just kidding! The music renews a fair amount if tracks including the aforementioned, but what's really nice how it's applied. When Sorario Days (the original OP) started playing, I think the back part of my brain stopped working and I submitted to the screen and the anime took over. In summary, the soundtrack enhances the quality to an extent where it can obliterate your senses. Same characters, but this movie focuses in on Nia in its new scenes. No complaints. Some characters that did or did not survive the first series encounter different fates too, so watch out for those. Some also get new mechas, which might I add, are awesome. And of course, the effect of Kamina's manly spirit still resonates as strong in this movie as it did before, even though he plays a minor role in the story. How much did I like this movie? I screamed at my screen for the last 15 minutes of the movie and was carried by the presentation throughout. A truly spectacular movie. There were moments of sadness, moments of joy, moments where it was hard to even blink. I hope this quick review is enough to wet your pallet for another exciting adventure with all your friends from the Dai-Gurren Brigade. This is a good movie to just flop down on the couch with, regardless of age or gender. Taste is a different matter. If you were not a fan of the original anime, this apple doesn't fall too far from the tree, and therefore you most likely won't enjoy this movie as much as I. I gave this anime a 10 because I felt it achieved all things I wanted from it - now you, the reader, have to decide on your own whether it was a 10 or not. Lagann-hen is an exhilarating production with a setting of monumental proportions, though not without its flaws, which - in some cases - are unfortunately more apparent than in the first installment. The movie picks up right where Gurren-hen left off, though the opening sequences have been hugely condensed in order to quickly drive the plot into the second arc of the story. The setting expands in Lagann-hen, we travel from Earths surface into interstellar territory, in line with the TV show, although small sections of the story have diverged from the series, some understandably and others disappointingly. Certain new ideas seem extremely rushed, dragging what was a fairly engrossing - if manic - plot downwards. Nevertheless, the scale of the story is as ever admirable and thrilling, though the developmental issues carry over from Gurren-hen, making it clear the Gurren-hen/Lagann-hen film double was more an excuse to cash in on the series, rather than create a coherent piece separate from the TV show. The dialogue, at times, also encountered issues; present simply to move the story along without any natural flow to it. As in Gurren-hen, the rehashed sequences barely differ - if at all - from the series, but the new scenes go above and beyond. The new ending sequence is a powerhouse of action and zest, which will leave you wishing there was more, but unfortunately, there aren't as many new additions to Lagann-hen as there were in Gurren-hen. The staff really rely on the climatic sequence to blow you away, and while it may do just that, they don't really attempt anything deserving of praise throughout the opening and middle acts. Taku Iwasaki's score returns for its third outing with no changes, yet the sound and music is a noticeable drop from the first installment. The music felt poorly timed, jumbled and out of place during much of the film, and often it was at such a low volume it may as well have been absent. Even the sound effects, which could have been turned up a couple of notches it give it that extra umph, were disappointing. The sound department manage to redeem themselves a little towards the end with larger emphasis on the music, but it's a shame an aspect presented so well in the series wasn't handled better in Lagann-hen. Developmental issues mean that Rossiu and Kittan are still very much unknown characters to the audience of the movies, and Lagann-hen does little to remedy this. The film makes use of its supporting cast, more so than in Gurren-hen, but extra screen time doesn't equal development. They are still empty shells with a single trait, which isn't far below their series counterparts, but disappointing nevertheless as they lack any kind of background or character motivation, and the movie absolutely requires you watch the series in order to comprehend the characters' depth. The stand-out segment in Lagann-hen is the climatic sequence, which delivers and then some, and is probably the sole reason to venture into the second installment beyond just re-watching the series. Pushed for time, Lagann-hen is always moving, but even so it begins to tire. Undoubtedly, far more could have been done to create a more coherent adaptation of the series, and it's unfortunate the studio behind such an enjoyable work would rather cut corners and cash in, than create a comprehensive piece both long-time fans and those new to the franchise can enjoy. To write a spoiler-free review of lagann-hen is difficult, especially since there is quite some variation from the show. However, I will write this review on the basis that I don't want to spoil TTGL or Lagann-hen. First things to say would be, Lagann-hen is a must watch. To review Lagann-hen I think I should sum up some of the premonitions I had before watching it. I had seen Gurren-hen, and although I enjoyed it, I actually didn't like it as much as the series. Gurren-hen seemed a bit rushed to cover the first part of the series, and was chopped and changed here and there. So coming into Lagann-hen, I was expecting this to be Gurren-hen for the second half of the show... Boy was I wrong. Like Gurren-hen it does re-use a lot of images from the anime, however at most points they are in a different order, or given new narration. Large sections were redone completely. The story is much the same as TTGL, however some minor differences persist. I won't say them in detail, lest I plague this review with spoilers, but I will say that I think the main cast is better represented in this movie. 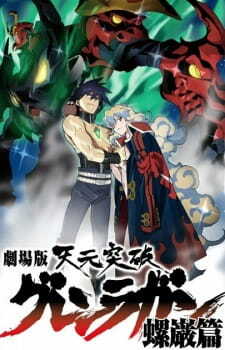 Each character is shown thinking or doing things that may have happened off screen in the TTGL anime. This sheds new light on some characters, while giving others more of a noticeable role. There was not one change I disliked about Lagann-hen. All the good bits were there, and all the bad bits were polished into good bits. Never once did the story feel rushed. The actual ending of the show is nudged off course from the anime, but not in a way that breaks any of the continuity. It seems like every opportunity Ginax had to make the show better, they took it. Some places it seems almost unnecessary to alter the little things, but the overall effect is an amazing addition of depth to the plot. Sound, was brilliant. If I can make a recommendation, listen to this in surround sound. It's not just the sound effects that have been given extra "omph", the entire voice acting matched perfectly, new lines flowed into old ones, narration covered some points and none of it had even the slightest flaw. I was surprised to hear the TTGL anime theme music kick in at the right place, I don't think any other piece of music could have fit there, sure enoguh, Ginax kept it for the movie. Full points here, it's been a long time since any show has had this much music that just screams, raps and wails ROW ROW FIGHT THE POWAH! Character development was something I enjoyed very, VERY much. This was probably the biggest change to the show. Each character, no matter how minor, was given full attention and detail. Their roles never waned from their original, and only expanded the Dai-Gurren Dan feel. There are some surprising things that the characters go through in the moive, that is not present in the anime, it'll be obvious what I mean when you watch it. The characters are surprisingly human, if you cut them, they bleed, is one of the things the movie makes obvious. But it also shows, you cut a lion and you'll be faced with the claws. Dodge the claws and the fangs are next. The characters prove an unrelenting injection of determination and awesome, that the series did so well. Enjoyment is next. Woah, did I ever enjoy it! Personally, this movie had me hooked. Having seen Gurren-hen, I was a bit inclined to think "skip" for the first bit and then just watch the end. But no, it had me on the edge of my seat all the way, even though I knew exactly what was going to happen! One of the things that made this movie more enjoyable, was the inclusion of a few jokes here and there. Even at the most serious of times, they put in a little one liner that really brought it down to earth. This is TTGL, after all, was the feeling I got from these kind of moments. Lagann-hen has to be THE crowning moment of awesome for Gainax, if not all anime. I've seen a lot of mecha shows, I've seen a lot of hot-blooded pilots, cool super attacks and climatic battles, but none scratch the level of awesome exuded by Lagann-hen. Strangely, I'm not over-exaggerating here. But I will admit, Lagann-hen doesn't stand on its own. I don't think Gurren-hen supports it well enough to just watch those two on their own. And if you didn't like the series, then re-watching the ending may not cut it for you. Even though the ending to the movie covers far more plot and detail than the series did (and it did it in less time to). My overall conclusion would be, Lagann-hen is TTGL at its best. I don't think it could be perfected by even 1% more. If you even enjoyed 1/2 episode from the latter half of TTGL, you will enjoy this movie. Does Nia die in this movie?